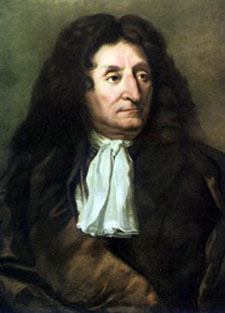 17th-century portrait of Jean de La Fontaine. Artist unknown. La Fontaine is the more commonly known name for Jean de La Fontaine, a popular French poet and fabulist, a teller of fables. La Fontaine’s Fables, also simply called Fables (and in the original French, Fables de La Fontaine), was translated by Elizur Wright, and published in 1882, after a previous edition from 1841 went out of print. Born into a wealthy family in Château-Thierry in 1621, Jean de La Fontaine had a comfortable life, and was the oldest of the family. Although he first began a career as a ranger, upon taking up writing, he was part of the Rue du Vieux Colombier, a quartet of famous French literary figures, and published his first epic, Adonis, in 1658. La Fontaine’s Fables were greatly influenced by those fables of Aesop, wherein lessons of mortality are extended. Scholars cite his second collection was inspired by East Asian works. The Fables are rich with satire, and were published originally in twelve volumes, with the first published in 1668. The total collection ranges around 240 poems in their original French, and some aren’t truly fables, but musings or small poems. The most present element in his fables and tales is irony, and although he was inspired by others, the Fables are one of the most revered French works to date.